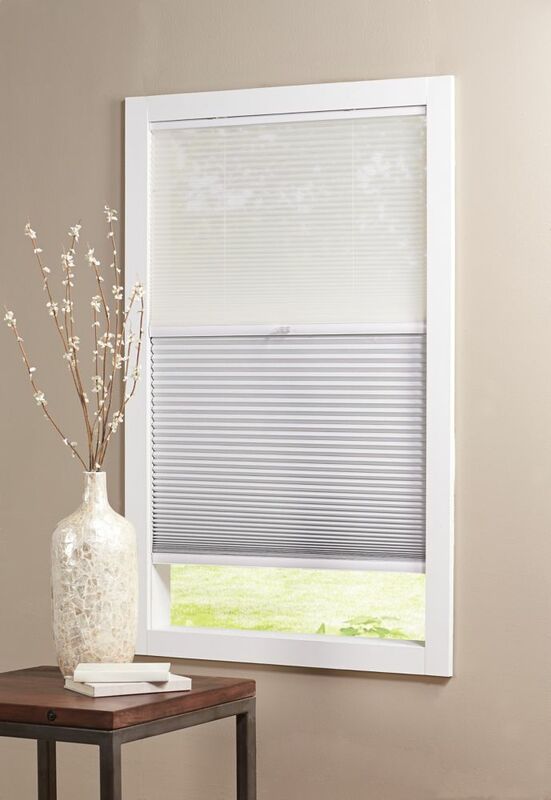 Cordless Day/Night Cellular Shade Sheer/Shadow White 48-inch x 72-inch (Actual width 47.625-inch) The right window shade can refresh your room with light and colour. When making your choices, be sure to think about how much light you need. A sheer cellular shade will filter light gently into your space, while a black out cellular shade will stop unwanted brightness. You'll also want to consider tone and texture. What shade will complement your furniture, floor coverings and wall colour? Cordless Day/Night Cellular Shade Sheer/Shadow White 48-inch x 72-inch (Actual width 47.625-inch) is rated 5.0 out of 5 by 1. Rated 5 out of 5 by Jbottawa from Nice looking - very practical. Bought these blinds a few months ago, love them. Use the sheers through the day to keep bright sun out and provide privacy - at night close them completely for privacy. Can also keep them completely open if choose to. Good quality. Bought these for 7 of my windows on main floor, (various sizes). In bedrooms bought the complete room darkening blinds, also very happy with them. They can be cut to size in Home Depot store. CustomerCare's answer is incorrect! I just bought two 27&quot; and one 60&quot; and they both come with brackets that can be mounted either inside (top) of window frame or outside on the wall but you may need to make sure the side has solid wood or much longer screws to go through drywall and reach a wood stud otherwise the brackets will loosen overtime (even with drywall plugs). Note that the 27 (harder to click in place) and 60 (easier to click in place but leaves a bigger gap on top) have different brackets but both do work. Thank you for your question. The shades have a limited lifetime warranty. You can exchange the blind to receive a new one. Please visit your local store. Is there a way to open the blind completely from the bottom up so that there is no blind in front of the window? Thank you for your question. You can lift the entire blind to the top of the window frame to have an open view of the window. Do these come with hardware for outside mounting as well if needed? Thank you for your question. Yes the installation bracket that is included is for inside mounting and outside mounting.